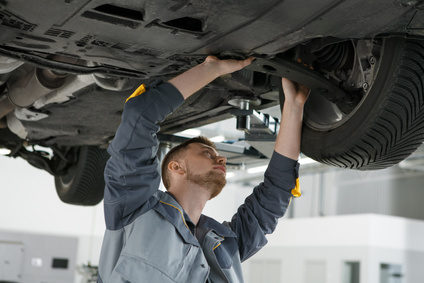 Most car owners overlook the underside of their vehicles during repair and maintenance, which can be a costly mistake. This part of a car is susceptible to rusting and corrosion, as it frequently comes into contact with water, mud, salt, and debris. There are a few ways to prevent rust from gnawing away the undercarriage of your car. Whether you’re buying a brand new car or one of the online salvage cars for sale, the following tips will help in preventing rusting and corrosion of the undercarriage of your car. Read on. Prevention is always better than cure. Avoid puddles whenever you can. Road salt and grimy standing water make a deadly cocktail that takes no time to initiate the process of rusting. When the undercarriage is splashed repeatedly with salt water and minerals from puddles, and do not clean the car as frequently as you should, rust catches up fast. This is another prerequisite to prevent rusting. Clean the undercarriage with water as often as possible. Lift the car on a hoist to position it at a convenient height so that you can get a good view of the undercarriage. Use a high-pressure car washing hose or spray gun to blast the accumulated dirt off. This is particularly important during rainy seasons. All cars come with a drainage system that spreads to various sections of the vehicle. These drains keep water from accumulating, thereby help prevent rusting. Sometimes, the drains get blocked with dirt or tree leaves, which disrupts their normal function. Check the drains located on the floor, fenders and other parts of the vehicle and make sure they are clean. Another effective way to protect the undercarriage of your car is to get an oil, wax or tar-based coating. Such coatings act as a barrier and keep out rust-causing salt, moisture, and dirt. Atomized oil sprays are used widely today to undercoat the underside of most cars. They can be applied to both new and used cars. If you find that rust has already set in, use a sandpaper to remove it and then apply the undercoat. When it comes to vehicle maintenance, measures should be taken to protect the undercarriage of the vehicle from rust. This will ensure that the car remains unscathed for a long time, even in adverse road conditions. If you’re yet to buy your dream car to take care of, AutoBidMaster can help. We are a trusted salvage car auction website with a large inventory of salvage vehicles for sale. If you have any questions, simply call +1 (503) 298-4300 or fill out our contact form and we’ll take it from there.